Join the Scouting Alumni Association today to reconnect with Scouting and help build better youth. The Boy Scouts of America Scouting Alumni Association welcomes everyone positively and personally impacted by the Boy Scouts of America—former Scouts, family members of Scouts past and present, volunteers past and present, and the millions of Americans who benefit from Scouting in their communities every day—to join today. 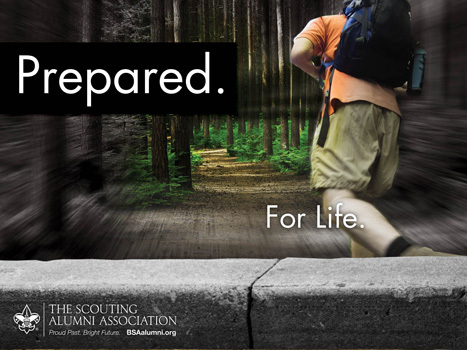 By joining the Scouting Alumni Association, you'll stay up to speed on what's happening in Scouting and help youth experience the excitement, challenges, and adventure that Scouting has to offer. Packet sent upon joining containing an embossed affiliation card, lapel pin, luggage tag, and window cling. Quarterly electronic newsletter Alumni Alive! 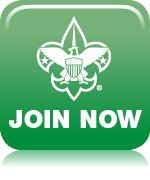 It's a popular, convenient update of all the great happenings within Scouting today. Cell phone ring tones of 10 bugle calls. This is fun! Watch for people who think "Reveille" requires a salute! Free one-year membership to the National Scouting Museum. This award-winning, world-class museum is located in Irving, Texas, across the street from the BSA national office. Membership includes the museum newsletter, Bridges & Trails, online plus free admission to the museum and Norman Rockwell art gallery for up to four guests when you show your Scouting Alumni Association affiliation card. One-time discount on a purchase from the BSA Supply Group. You can purchase online at Scoutstuff.org or in person at a Scout shop at your local council service center. Eagle Scouts are also encouraged to join the Eagle Scout Association - SHAC,a fellowship of Eagle Scout Alumni living or working anywhere in the 16 county service area of the council. Membership is open to all Eagle Scouts, and there is no charge to join the Eagle Scout Association - SHAC.